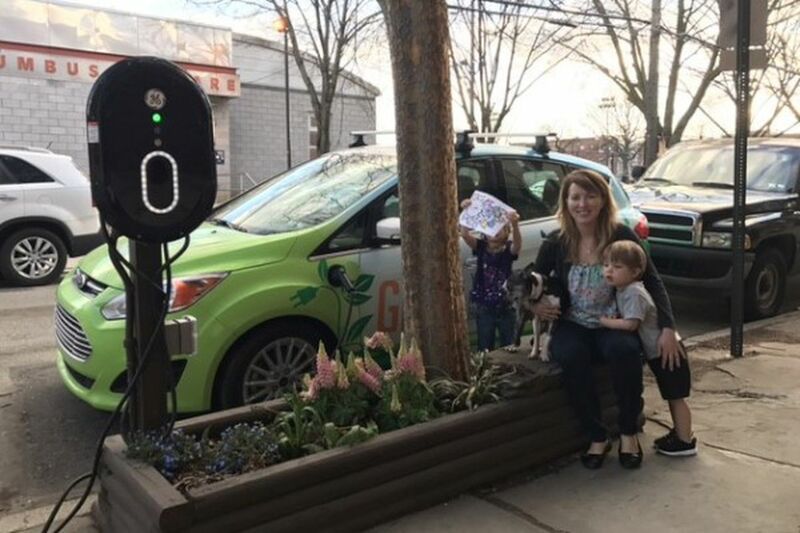 Electric car owner Debbie Lewis Lutz relaxes with her children, Rose, 4, and Gus, 2, as her car charges in front of her home. A bill that suspends the reservation of on-street parking spots for electric vehicles passed in City Council on Thursday, following spirited complaints from residents on both sides of the issue. Council voted, 11-6, to place a moratorium on new electric-vehicle parking permits, which allow car owners to use charging stations that they purchase and construct outside their homes. The Philadelphia Parking Authority has sold about 60 permits, mostly in the First District, encompassing parts of Center City and South Philadelphia. Councilmen David Oh and Mark Squilla, co-sponsors of the bill, argued that the moratorium was needed to curb the influx of permits while giving the city time to come up with a more fair and updated plan to provide charging stations and parking for electric vehicles citywide. The current ordinance is 10 years old and allows no more than two permits per block. "EV cars in Philadelphia cannot be lost to a neighborhood turf war over parking," Debra Lewis-Lutz, an electric vehicle owner who lives in South Philadelphia, said before the vote. "Cleaning up pollution that is plaguing our city is more important." Jeff Braff, a member of the Center City Residents Association and the Philadelphia Crosstown Coalition who supports the moratorium, called the current system unfair. "We believe the use of electric vehicles should be encouraged," Braff said. "The problem is the existing legislation [takes] a public good - an on-street parking place - and effectively privatizes it for the use of a single person, the person who controls the electric switch." The ordinance not only bans new permits but also takes some freedom away from current permit holders. Permit holders still have 24/7 access to the spots but under the new bill, empty spots may be used by the public for two-hour parking between 6 a.m. and 6 p.m. The moratorium has no end date, though Squilla introduced a separate bill Thursday that would place a two-year expiration on the permit ban, which he said should prompt lawmakers to create a new system with haste. But even two years without room for growth bothered Councilman Allan Domb, one of six members to vote against the bill, a rarity in the body, which typically votes unanimously. "My concern is 56 people who played by the rules, made an investment, some of these investments were not inexpensive...and now we're changing the rules on those people, that's my biggest issue with this," he said. Councilman Curtis Jones Jr. said a ban sent an unwelcoming message to environmentally conscious residents and the green-tech industry. "If you want to be a clean city, a clean, green city, then you can't use the 'm' word," he said. In addition to Domb and Jones, voting no were Blondell Reynolds Brown, Derek Green, Helen Gym, and Al Taubenberger. The bill will go to Mayor Kenney, who as a councilman sponsored the original legislation allowing the electric parking spots. Kenney said he would sign the bill. "That's the will of Council," he said. "It's a moratorium, it's not an end. We can give it a shot to ease it for a while until we figure out a better solution."